Over the centuries, men and women have changed history by pushing the boundaries of science and nature and constantly innovating. When new products disrupt an industry there’s always cause and effect, enter the created diamond or “synthetics” as the diamond miners disparagingly call them. I offer choices to my clients whether it be natural diamonds mined from deep below the earth’s crust or created diamonds grown in a laboratory, all with full disclosure of origin. The created diamonds I select for my clients are grown using the chemical vapor deposition (CVD) process, and are high-pressure, high-temperature (HPHT) treated to improve their colour. Heat treatment is a typical method used to enhance a gemstone’s colour characteristics and is widely applied in the coloured gemstone industry. A normal practice as long as it is clearly explained to clients. Created diamonds are now more common as improvements to the technology involved in growing them evolves; sizes are increasing, and rare coloured created diamonds are becoming available as techniques develop. Created diamonds make the unaffordable affordable. 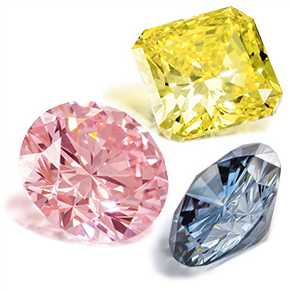 Consumers may never see pink, yellow or blue diamonds in their lifetime, and even if they do see them, they’d probably be unable to buy them. While the “conflict free” aspect of created diamonds has been used as a selling tool in the past, the majority of the diamonds available to consumers are “conflict free”, however, the lower price of created diamonds is what appeals most to consumers, particularly with coloured diamonds, the natural versions being extremely rare and more expensive. I source my created diamonds from a very well respected company in Florida who have recently rolled out a programme with one of the USA’s largest fine jewellery retailers. Created diamonds are unlikely to replace traditionally mined diamonds, however, I want to give my clients an alternative. Diamonds celebrate love – whether it’s a natural, mined diamond or a created diamond and for whatever reasons are dearest to your heart be it social conscience, tradition, technology or price, you have the choice to celebrate love whichever way you choose!